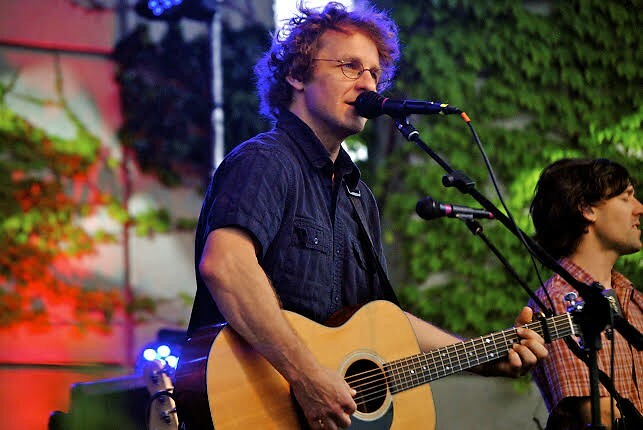 By funneling Jerry Garcia's passion, Bob Dylan’s spoken word grizzle, Neil Young's clarity, and George Harrison’s innocence into his own songs, Railroad Earth frontman Todd Sheaffer earned his spot among the greatest rock'n'roll troubadours. For all the greatness that was Railroad Earth, there was still another excellent band to follow them - Yonder Mountain String Band. The crowd that stuck around through intermittent rain were rewarded handsomely with a boot-stompin dance party from Yonder. Special guest Allie Kral nearly made up for the fact that Yonder was without their former frontman and Mandolinist, Jeff Austin. 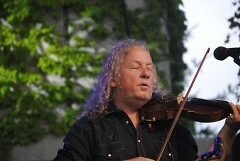 Kral's hot fiddling inspired some of the biggest roars of the evening. Throughout the night, members of Yonder kept referencing the beauty and psychedelia of Meijer Gardens, which inspired them to perform a sweeping bluegrass rendition of Pink Floyd's "Dogs." The depth created from all the stringed instruments during the powerful Floyd moments was nothing short of magical. Yonder Mountain String Band is nothing to shake a stick at, with or without Jeff Austin. A crisp gust of wind shakes the Meijer Gardens trees with applause as the Americana inspired Railroad Earth, affectionately known as “Railroad” among fans, takes the stage; the first act in a co-headlining performance with Yonder Mountain String Band. Railroad seamlessly transitions into one of their instrumental bluegrass tunes,”420 Hornpipe.” With a mandolin-fiddle harmony holding the melody, this merry-go-round of a song features solos from fiddle-wielding Tim Carbone, mandolinist John Skehan, multi-instrumentalist Andy Goessling on banjo, and Sheaffer on acoustic guitar. Sheaffer’s voice, whether singing or just talking to the crowd, is the most soulful, soothing voice the jam scene has been blessed with since Jerry Garcia in his 70's heyday; it is one of the biggest reasons Railroad has earned such a dedicated following of "hobos," as his fans are called. By funneling Garcia's passion, Bob Dylan’s spoken word grizzle, Tom Petty’s nasality and George Harrison’s heartfelt innocence into his own sun-splashed songs, Sheaffer has earned his spot among the greatest rock'n'roll troubadours of all time. He is a great storm of a songwriter and guitarist, creating meaningful, moving songs out of nearly anything: trains of the transcontinental railroad, the day to day of a black bear, dandelion wine, abstract feelings of happiness or forgiveness, a river, an old man settling on a plot of land and the list goes on. Another driving force behind the loyal hobos is the sheer wizardry of the cast of musicians surrounding Sheaffer. The rhythm section – Carey Harmon on drums and Andrew Altman on upright and electric bass – consistently holds down the groove so the rest of the band can shine. Carbone, in addition to playing the fiddle like happily possessed marionette doll, also plays electric guitar on the band’s more rock-infused songs. Skehan occasionally switches from his mandolin to piano and a bouzouki. The most impressive cast member, though, is Goessling. 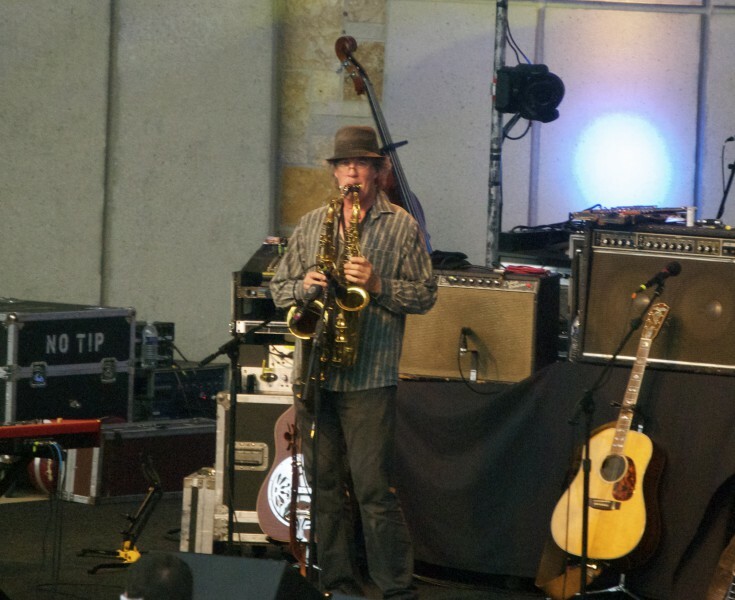 The list of the instruments he plays skillfully is a long one: acoustic guitar, banjo, dobro, mandolin, lap steel, flute, pennywhistle and saxophones. The tone continued with “Came Up Smilin’,” a blissful, slowed down tune about a boy who took a dive off a cliff and did as the song suggests. This piece is a great instance of Sheaffer capturing the seemingly mundane and turning it into something elegant and powerful. 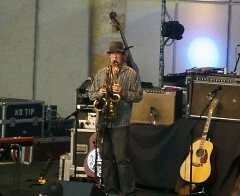 Railroad’s country-rock rendition of the Robert Earl Keen “For Love” follows, shifting the mood of the show to a gloomier place as ominous clouds gathered over the amphitheater. “Hangtown Ball,” a historically inspired song about a Gold Rush town famous for its hangings, is next. Afterward, someone in the crowd shouts, “play a happier song,” apparently a little depressed by the last two songs. As if they heard, Railroad starts into “Donkey for Sale,” a fun, swinging tune which features Goessling playing two saxophones simultaneously, one with each hand. "Oh, while you have the eyes…take the time to look around/oh, while you have the ears…take the time to hear the sounds…And then you’re seeing in a light you didn’t know was glowin’/and your walkin’ in a stream you didn’t know was flowin’/every beat of your heart, open, love is formin’/oh! and there’s a feeling runnin’ through ya /oh! and then you’re smilin’ like a Buddha." For more photos from the night, visit here.